Well, it is an another well know issue by Microsoft. * Experiencing inconsistencies with some user profiles where the user Account name attribute is observed to vary between e.g. Domain\aloş and Domain\alos . This is observed in SharePoint Central Administration > User Profile Service Application > Manage User Profiles and Edit User Profile sections and therefore impacting approval workflows where they are using InfoPath Forms . *Connecting local domain to Sharepoint server, in domain are login with diacritics, in sharepoint there are login of users with diacritics – wrongly displayed .Also when search for the user in people picker we get two users account one with account name with diacritics and second without it. Add a user in Active Directory. 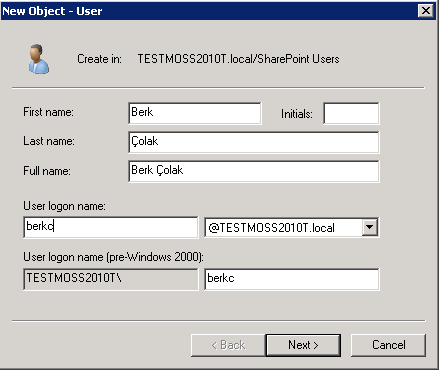 In example we are adding TESTMOSS2010T\Berkc user. As you can see it is “TESTMOSS2010T\berkç” . Well so far so good . SharePoint accept it without any problem when you click the OK. If we try without diacritics like “berkc” it is also accepted . Hmm , thats looks strange . (Well actually SharePoint has already saved the data in UserInfo table & UserInformation List as ‘berkç’) and SharePoint is clever enough to understand this is same user. Well , I dont want to use it like this. This user should be “TESTMOSS2010T\berkc” so how can i change it . After i changed that user account , hmm i can see now 2 account if i search from people-picker . The LSA maintains a SID cache on domain member computers. This cache stores mappings between SIDs and user names. If the SID information exists in the local cache, the LSA returns the cached user name information instead of checking whether the user name has changed. The local SID cache helps reduce domain controller workload and network traffic. However, inconsistency may occur between the local cache and the domain controllers. If you want to get rid-off this behavour ; disable LSA cache: http://support.microsoft.com/kb/946358. Open Registry Editor.To do this in Windows XP or in Windows Server 2003, click Start, click Run, type regedit, and then click OK.
To do this in Windows Vista and newer, Click Start, type regedit in the Start Search box, and then press ENTER. Type LsaLookupCacheMaxSize, and then press ENTER. Note The LsaLookupCacheMaxSize registry entry sets the maximum number of cached mappings that can be saved in the local SID cache. The default maximum number is 128. When the LsaLookupCacheMaxSize registry entry is set to 0, the local SID cache is disabled. Unfortunately there is no other resolution for this design.